Base class for the more common types of database errors. These are known to occur frequently, so we try to give friendly error messages for them. Definition at line 32 of file DBExpectedError.php. Definition at line 42 of file DBExpectedError.php. If a list of multiple possible keys was supplied to the constructor, this method may return any of these keys. After the message has been fetched, this method will return the key that was actually used to fetch the message. Definition at line 49 of file DBExpectedError.php. Definition at line 53 of file DBExpectedError.php. Definition at line 34 of file DBExpectedError.php. 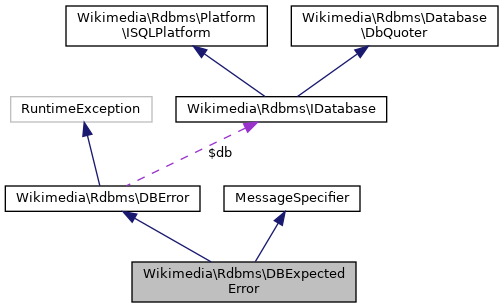 Referenced by Wikimedia\Rdbms\DBExpectedError\__construct(), and Wikimedia\Rdbms\DBExpectedError\getParams().